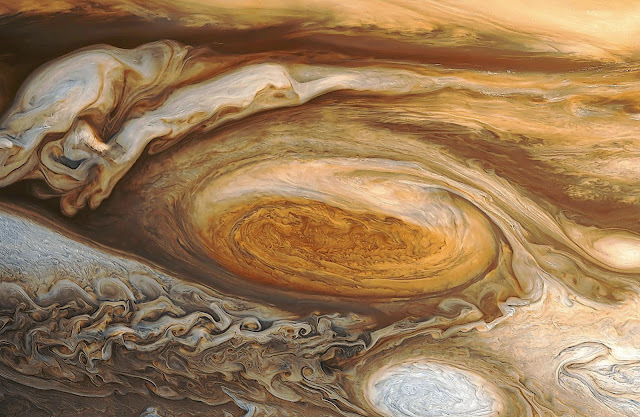 Jupiter's Great Red Spot probably began in one of two ways: It could have been a large, upward plume that hit the stratosphere and rolled up to produce a vortex. If a rising plume can reach upward to a part of the atmosphere that’s really stable, it will spread outward horizontally, and when it starts to spread out, if it’s in a really rapidly rotating system like Jupiter, the spreading out produces a vortex. The other possibility is that a jet stream went unstable and started a wavy oscillation, and when the amplitude of the wave became big enough, it broke, making vortices that then merged together. "Humour and wonder can be a double act"
From what causes do I derive my existence? "Art is not a mirror..."